The light is returning! Stronger sunlight is reaching Portland, Oregon, every day. On my walks each afternoon, the daylight is brighter. Just one month ago when the sun was at the extreme of its southern circuit. On another tangent, I hope that stronger light of understanding can reach Burns, Oregon very soon. But first: the sunlight. 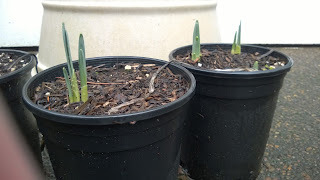 In my wife’s and my yard the daffodils are showing their green sprouts. We have a terrific arrangement! Lucy plants and tends. I photograph! 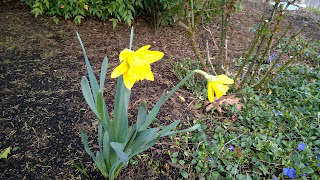 I’m astonished every year by the urgency of nature to get spring underway. Spring (the season) can be taken literally as Spring into life. I try to record this return of light with my camera. At the University of Puget Sound several years ago I asked a colleague of mine what force caused plants to bud and sprout. Was it, I asked, the increase in temperature? He thought before he answered and actually said, “I’ve never thought about that before.” But, after pausing, he said, “I think it’s the increase of light.” If he’s correct, plants respond to light. Human beings should, too--biologically, like the plants and intellectually, as in "I see!" Back to gardening and photography for me. I’ll enjoy the light of spring.